Veterans Day is a time to honor the brave men and women who have served our country. It's also a great way for our brave heros to get a little debt relief! As a way to say “thank you” to these individuals, many restaurants throughout the United States offer discounted and free meals to veterans and active service members on this day. The infographic below, from Fast Track Debt Relief, lists some of the restaurants where veterans and military personnel can eat for free on Veterans Day. If you plan on visiting any of these restaurants, be sure to show up in uniform, or bring your military ID or proof of service. You may also want to call ahead to make sure that the restaurant location near you is participating. 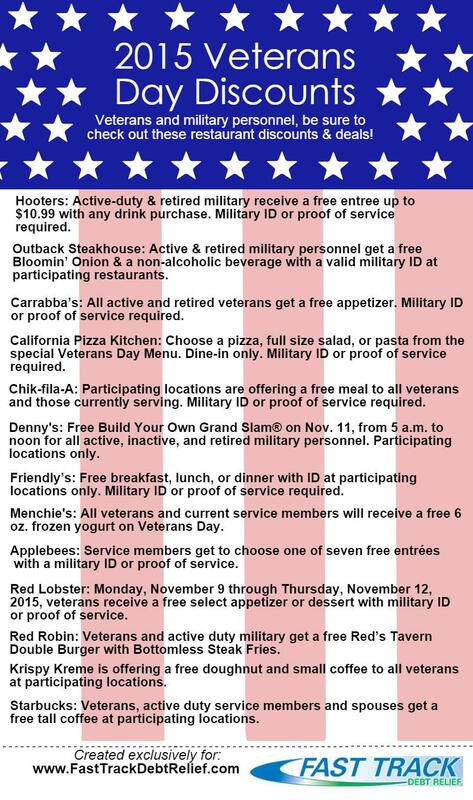 Some of the restaurants that are giving away free meals on Veterans Day include Hooters, Outback Steakhouse, Carrabba’s, California Pizza Kitchen, Chik-Fil-A, Denny’s, Friendly’s, Menchie’s, Applebees, Red Lobster, Red Robin, Krispy Kreme, and Starbucks. Remember: Veterans Day is Wednesday, November 11, 2015!